Contemporary, original design, healthy, innovative food, and light-filled rooms with numerous mod-cons are all on offer at Barceló Sants, which also happens to be the best connected hotel in Barcelona. 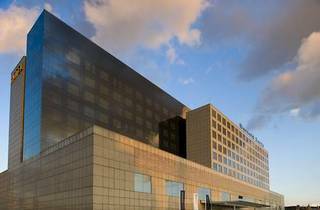 While a hotel constructed over a train station might not immediately come to mind as a premium place to stay, Barceló Sants breaks all those rules and instead stands out when it comes to comfort, style and services. An outer space theme runs throughout the hotel, giving it instant originality, while modern designer furnishings and numerous services ensure that guests can enjoy a memorable, comfortable break there. Thanks to its high position and a design that includes large windows, the 378 bedrooms are full of natural light and provide great views of the city, while the minimalist open-plan design and touches relating to space create a hotel experience unlike many others. All are equipped with the essential mod-cons and practical features, and if you’re travelling in a group or with family, connecting rooms and suites are available. Two restaurants serve dishes that are both healthy and innovative, and you can choose between a buffet at Oxygen restaurant and à la carte service at Hydrogen, which has been designed like a pseudo gastro laboratory. If you prefer just a snack, try the Nitrogen café, and for a cocktail or G&T at the end of a busy day, head to the Orbital bar. With a massage service, sauna and gym also available on-site, the Barceló Sants combines an inventive futuristic style with all you could want from a top-class hotel. 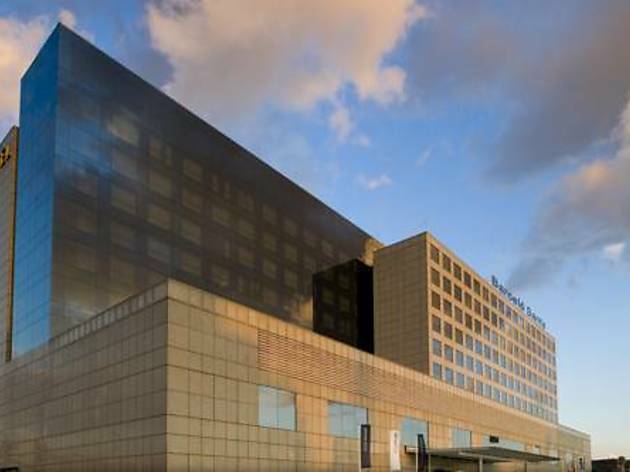 Location: Situated on top of Barcelona’s main train station, Sants-Estació, and with direct access to the platforms (for trains to the airport and the high-speed AVE service to Madrid and Paris, among others) and metro network, Barceló Sants is the best connected hotel in the city. Various buses stop just outside, giving you plentiful options for getting quickly to the centre and other places such as the beach and Camp Nou. Sants Es Crema: This new gourmet eatery that aims to give new twists to the traditional Catalan concept of 'mar i muntanya' ('sea and mountain'), which combines seafood and meat in a single dish. That means creations like an oyster with pig trotters, or pigeon with mussels and vinaigrette. The restaurant’s name means 'Sants is Burning', inspired by The Clash song 'London’s burning', and the ethos there is an appropriate mix of anarchy and fun. Bodegueta Cal Pep: It’s well-known in Barcelona that the bars and restaurants close to (or even inside) the city’s markets are some of the best places to eat. And Cal Pep provides firm proof of such. Just around the corner from Mercat de Sants, they specialise in gourmet tinned seafood including crab, sea snails and razor clams, as well as other delicacies to accompany a glass of wine or vermouth. Llet Crua: Opened in 2016, this cheese shop is small but well worth a visit thanks to its carefully selected range of unpasteurised ('llet crua' translates as 'raw milk') cheeses created by independent producers from Catalonia, Spain and further afield that you will struggle to find elsewhere. Santa Burg: This is one of the places that has been at the vanguard of the gourmet burger movement that sprung up in Barcelona some five years ago. The aim is to serve dishes that are healthy and delicious, and at Santa Burg they succeed with distinction with a variety of creations such as the Richard Burger, with onion confit, foie and egg. Where possible, they will adapt what’s on the menu to the particular tastes of clients. Celler de Gelida: This exemplary wine shop has been run by the same family for some five generations, having been founded back in 1895. It stocks hundreds of varieties including many Catalan reds, whites and cavas, along with less well-known but just as appetising local liquors. Good for: Leisure and business travellers who like to be close to transportation options but also look for comfort, modernity and a range of services when it comes to their hotel. Anyone who wants to try a different kind of accommodation, where the effort’s been made to bring originality to the hotel experience. Amenities: Gym, Sauna, Restaurants, Café, Bar, Free WiFi, Minibar, Room service, Laundry, Concierge. Time Out tip: If you need to jump in a taxi while staying at the Barceló Sants, it’s worth avoiding the official taxi ranks at the station and walking a few minutes along one of the adjoining main roads. That’s because ever since the high-speed AVE train started stopping there, city taxis can charge a supplement for fares picked up at Sants-Estació.